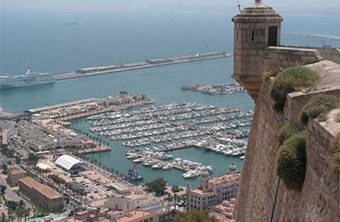 ALICANTE has transformed itself in less than a decade from a quiet port to an attractive place with a spirited nightlife. And unlike it's coastal neighbours, it's a real town, living for much more than tourism alone. It exports wine, olive oil, and fruit, and has light industries, including food-processing, leather, textiles, and pottery. For a selection of Holiday homes in Gran Alicant click HERE. All can be be booked while online and all are private. In between the constant nights out, feasts of excellent paella, siestas and bouts of basking on the beach, there are loads of other things to keep you busy. The shopping is excellent; there are plenty of museums and historical places of interest, delicious weather and lots of water-based sports. 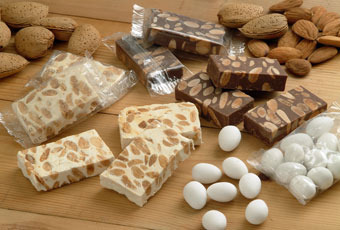 The area's food specialty are turrones - honey and almond nougats. It's best to start exploring Alicante on the beachfront, along the city's main pedestrian walkway, the Expanada de Espana. 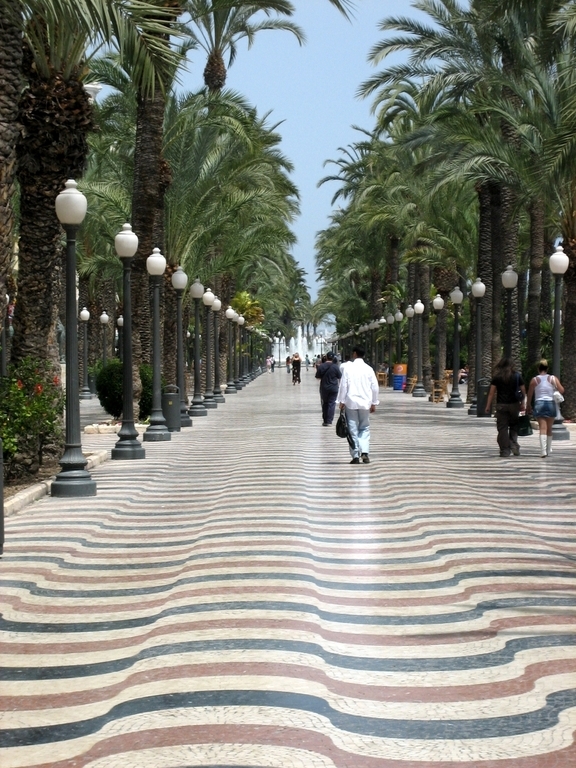 Spread out in front of the main part of the city, this elegant boulevard, stretching around the harbour, is shaded with palm trees and lined with shops and cafes. 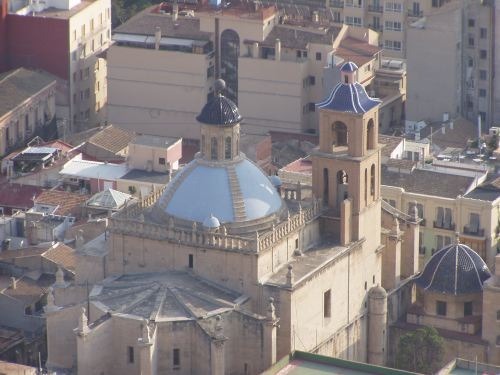 Northwest of the Expanada, towards the centre of the city, you'll see the imposing Cathedral de San Nicolas, and around it, the narrow streets of the El Barrio, which has most of the cheaper accommodation and the best nightlife. 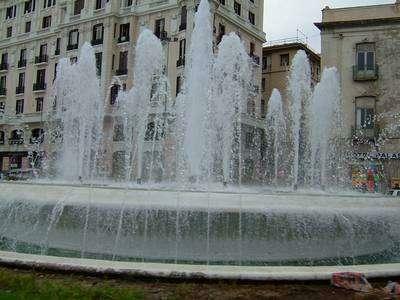 To the southwest, near the Calle de Italia, you'll find the main tourist office, post office, and the city's central bus and train stations. 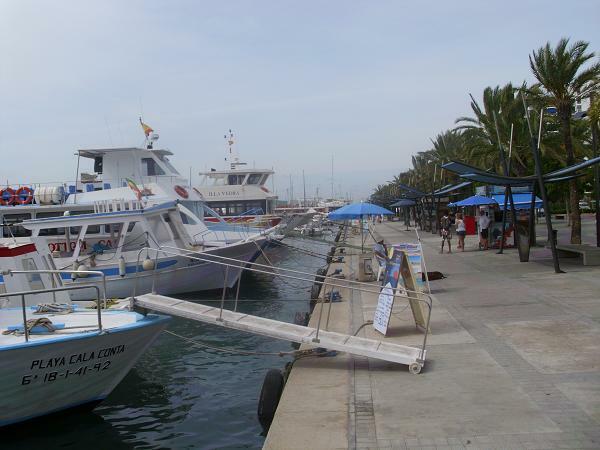 It has regular ferry services to the Balearic Islands, and the international airport of El Altet is nearby. Amongst the most notable features of the city is its castle, the "Castillo de Santa Barbara", which sits high above the city upon a cliff. An important festival takes place there in June, at the time of the Summer Solstice, the Bonfires of Saint John. The city is the headquarters of the Office for Harmonisation in the Internal Market. Pictured below is the wharf, located right down the street from the heart of town. 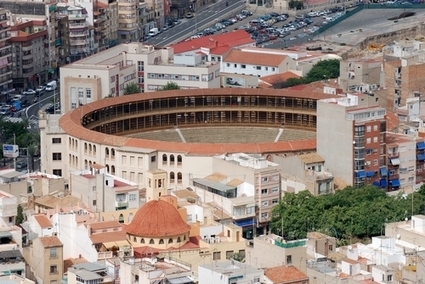 The bullring is one of the oldest in Spain still in use. Built in 1849 it has since been restored and enlarged. The current design dates from 1888. 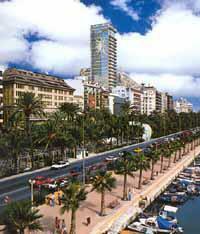 Alicante is a major education centre and has an impressive university, founded in 1979. At present it has over 30,000 students on a campus covering over one million square metres. The university has six higher schools, seven colleges and seven university institutes. It has branches in several provincial towns. Alicante was founded in 324 BV by the Greeks who named it Akra Leuke (White Peak). In 201 BC it was captured by the Romans who called it Lucentum, and Hannibal is said to have unloaded his famous war elephants here. Between 718 and 1249, the city was ruled by the Moors. In 1265 it was retaken by Alfonso X of Castile and incorporated into the Kingdom of Castile. In 1304 it was incorporated into the Kingdom of Valencia, in the Aragon Crown. The city was besieged by the French in 1709 and 1812, and later by the Federalists of Cartagena in 1873. In the Spanish Civil War, Alicante was one of the last cities to fall to Franco. An excursion inland can be made to Busot to see the Cuevas del Canelobre. The caves are 24km from Alicante in the direction of Benidorm and houses the highest vaults in the whole of Spain. The interior reminds you of a cathedral interior with its coloured lights illuminating the rock and mineral formations. Busot also offers the visitor many hiking routes with unique views and a range of restaurants with local cuisine. For a selection of Holiday homes Villas and Apartments in Gran Alicant click HERE. All can be be booked while online and all are private.